Image © Internet Defense League. Used by permission. The EFF, Mozilla, Reddit, WordPress and several other organizations have joined together in an initiative to marshall rapid responses whenever internet freedom is threatened, such as by the late unlamented SOPA bill. 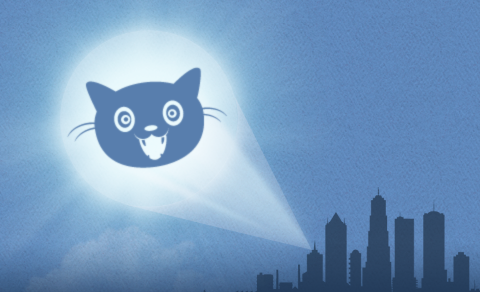 When internet freedom is threatened a “cat signal” graphic will appear on sites across the internet to mobilize users for action. Think Commissioner Gordon’s signal to Batman whenever Gotham was threatened. Full Disclosure: TCTReview is a proud member of the Internet Defense League. In 1995 Bob Cringely conducted a 64 minute interview with Steve Jobs for the show Triumph of the Nerds. About 10 minutes of the interview were used in the show. The master tape with the entire interview was subsequently lost. Following Job’s death last year a VHS copy of the entire interview was found in a garage. Cringely and his associates enhanced the old tape and got it released in theaters as The Lost Interview. It is now available on iTunes. Silicon Valley blogger/entrepreneur Andrew Chen reviews the interview and draws some great conclusions for everyone involved in new product development. Despite the overall positive response to the news of Yahoo’s choice of Marissa Mayer for its new CEO, there are some skeptics, largely from those who view Yahoo’s best chance for success to be in media and content. I think they’re wrong for a couple of reasons. First, it’s not clear that Yahoo’s best chance for success is as a pure media play—ask AOL how well that strategy has been working. Second, just because Mayer is less experienced with media and chief executive functions doesn’t mean she can’t come up to speed in those areas. Online education startup Coursera has been much in the news for the past couple of days. With participating institutions including Stanford, Princeton, Penn, Michigan, Caltech, Duke, Johns Hopkins, the University of Washington and others, the curriculum quality should be very high. The University of Washington even plans to give credit for its courses. The aim is to provide online courses to millions of students. Such Massive Open Online Courses (MOOCs) can be interactive and streamed in real-time. Some commentators are wondering if such online education initiatives, which are associated with some of the best universities in the world, could be the beginning of a higher education disruption. How does State U. compete when local students of modest means can take courses online from Stanford, Princeton and Cal-Tech? YouTube has launched a new face blurring feature with the stated purpose of protecting video subjects’ identity and human rights. Another stated use case is to anonymize the faces of children, for example in videos of sporting events. Just One More. littleBits: Prototyping or Playing? The company just closed a $3.65 million Series A investment round and is already selling a range of lego-like modules. The $89 starter kit looks like the way to go. It includes the following modules: power, button, dimmer, pressure sensor, pulse, LED, RGB LED , vibration motor, bargraph and wire. Check out some of the projects users have built. This video demonstrates the system. What is littleBits? from littleBits on Vimeo. 2014-02-04 TravelTech News Review: Seahawks Edition!